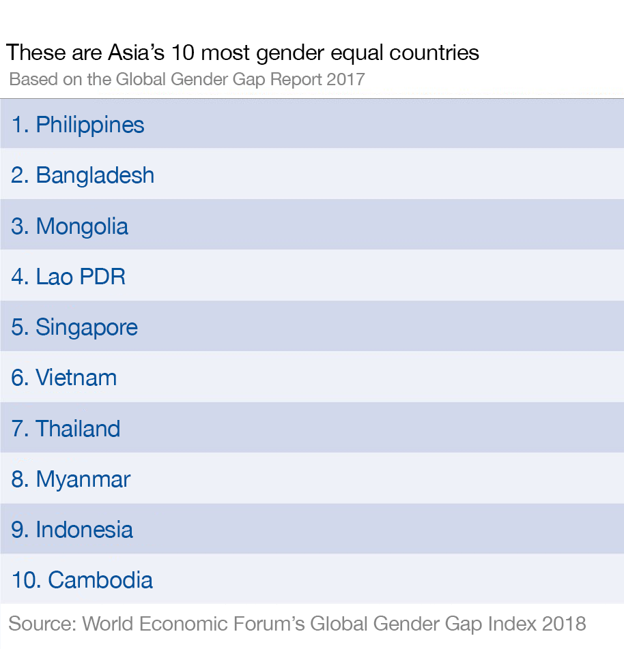 Although Vietnam experienced a decrease in gender parity for women in ministerial positions, it fully closed the gender gap among its technical and professional workers. Likewise, equal opportunities were recorded for enrolment in tertiary education sectors. Thailand saw greater gender parity for women in ministerial positions. Also, the country fully closed its gender gap for technical and professional workers and, like Vietnam, saw more parity with enrolment in tertiary education. In addition to increasing women’s share of technical and professional roles, closing the gap fully, Myanmar has reached near parity in total labour-force participation. However, the country’s women are under-represented in legislator, senior official and manager roles and inequalities exist in basic literacy rates and components of the GGGI report’s Health and Survival subindex. Europe, Africa or Asia – which region will close the economic gender gap first? Advances have been made in wage equality for similar work and opportunities for political empowerment. However, the previously closed gender gap for professional and technical workers has begun to widen for the second year in a row. The country’s women enjoy an increased share of legislator, senior official and management roles, and greater opportunities to enrol in tertiary education. Cambodia has maintained a closed gender gap for its Health and Survival index, too.